He was a priest in Laodicea in the time of the Emperor Diocletian. He spoke thus of himself before the torturers' tribunal: 'I am called Artemon, a servant of Christ my God. Sixteen years I was a reader, and read the services in the Church of my God; twenty-eight years a deacon, and read the Holy Gospel; and have now completed thirty years as a priest, teaching the people and setting them on the way of salvation with the help of Christ.' The judge took him to the temple of Aesculapius, where the priests kept great snakes, regarding them as gods. 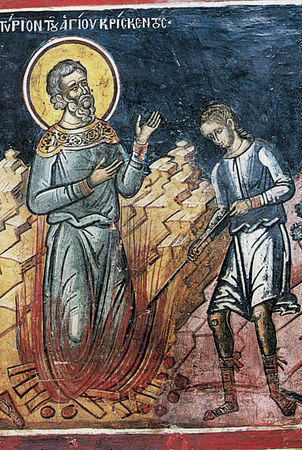 They meant the snakes to bite Artemon, but he made the sign of the Cross, and by its power riveted the snakes to the ground so that they could not bite him. He then brought them out to the courtyard and breathed on them, and they died instantly. All who saw this were filled with amazement. But the chief of the pagan priests of that temple, Vitalis, seeing this marvel, fell to his knees before Artemon and cried: 'Great is the Christian God!' The martyr baptised him, along with several of his friends. But the evil judge stood firm in his wickedness and tortured the aged Artemon in various ways. He intended at one time to cast him into burning pitch, but fell off his horse into it himself and was burned. Two eagles were seen to descend on him, lift him from his horse and cast him into the pitch. St Artemon remained free for a certain time and went about teaching the people, accompanied always by two tame deer. But he was arrested afresh and beheaded in the year 303. And his soul went to the Kingdom of Christ our God, whom he had served so faithfully. From the city of Myra in Lycia, he was an honoured and eminent citizen. He openly confessed his faith in Christ, and mocked at the lifeless idols. For this he was burned to death by the pagans. Born in Alexandria of devout parents, she was instructed in piety from her youth and married to a devout man at the age of fifteen. But her father-in-law was a foul old man and, in the absence of his son, fell on his daughter-in-law with the intention of taking away her honour. Thomais was terrified and, in her terror, reminded her father-in-law of God's Law and slipped out of his hands. After a long struggle, the father-in-law took out a knife and slaughtered Thomais, cutting her into two pieces. At that moment the punishment of God fell upon him: he was instantly blinded and was unable to find the door to get out of the room. He was arrested right there and taken for trial, where he was condemned to death. Thus Thomais suffered for the commandments of God and for marital fidelity and purity. It happened after that, that those who were tormented by lustful passions lifted up their prayers to St Thomais and received great help from her. 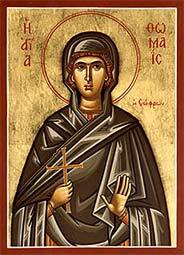 The great ascetic Daniel translated her relics to Scetis and laid them in the priests' cemetery. St Thomais suffered in 476.